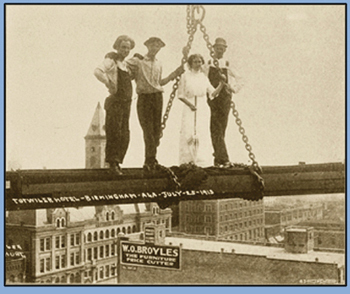 The wife of ironworker J. N. Johnson took a ten-story trip at the Tutwiler Hotel in Birmingham, Alabama in July, 1913. Photo courtesy of International Association of Bridge, Structural, Ornamental and Reinforcing Iron Workers. See this image in the On High: Bridge, Structural and Ornamental Ironworkers exhibit.